- Jerzees® Adult 5.6 Ounce Heavyweight Blend 50/50 Cotton/Polyester Pre-Shrunk Short Sleeve T-shirt With Pocket. - Taped shoulder to shoulder, with left chest pocket. - Ribbed crewneck collar with front neck coverseaming. - Two-needle hemmed, set-in sleeves and bottom. 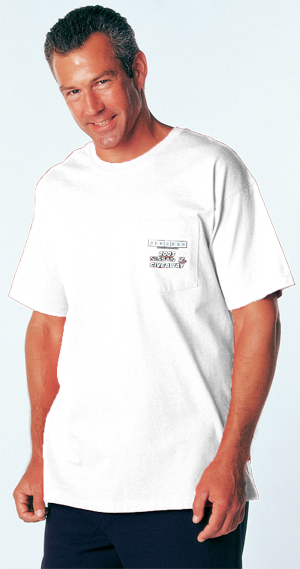 Jerzees® Adult 5.6 Ounce Heavyweight Blend 50/50 Cotton/Polyester Pre-Shrunk Short Sleeve T-shirt With Pocket. Taped shoulder to shoulder, with left chest pocket. Ribbed crewneck collar with front neck coverseaming. Two-needle hemmed, set-in sleeves and bottom. DISCONTINUED. Only select colors in broken size runs available.